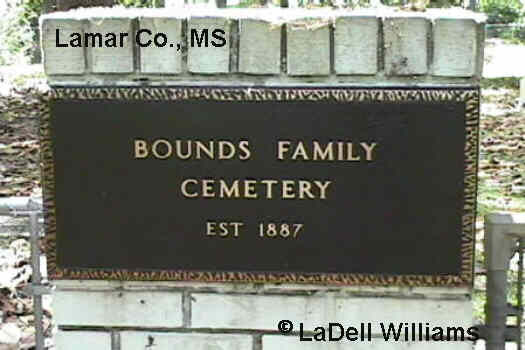 The Bounds Family Cemetery is located between Hattiesburg and Purvis. 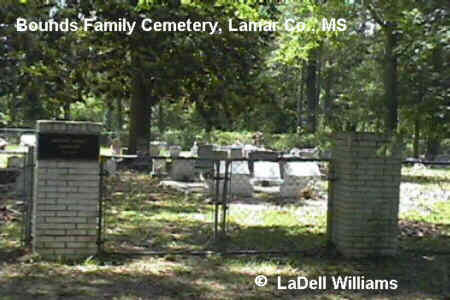 This is not the same as the Granny Bounds Cemetery, which is located elsewhere in the county. From US 98 at Bellevue, travel South on Hwy. 589 for 4.5 miles and turn left onto Burnt Bridge Road (about .1 mile prior to reaching Black Creek Bridge). Go .2 miles and turn right onto Davis Road (Mt. Zion / Burnt Bridge Church sits on the right), then go 1.5 miles to the cemetery on the right.